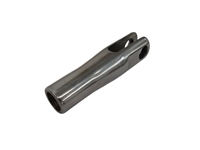 1/2 X 20 Turnbuckle Rod Only 1-5/8"
Replacement Stainless Steel Hex centers for the 1/2" X 20 thread turnbuckles. Add 4" for Overall Length. 1/2 X 20 Turnbuckle Rod Only 5-5/8"
1/2 X 20 Turnbuckle Rod Only 6-5/8"
Replacement Turnbuckle End for the Glenwood 1/2" Turnbuckles.